A quick and healthy snack item. 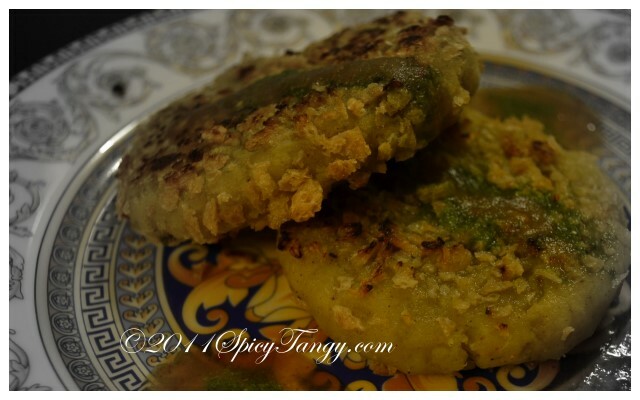 This is a healthy alternative to the traditional aloo tikki. If you have been meaning to add soya to your diet, this is a good way to start! Take half of the soya granules and soak them in water for 10 minutes. Squeeze the water out and keep aside. Do not soak the remaining half soya granules. We will use these to coat our patties. Boil the potatoes. Once they cool, peel the skin and mash them. Keep aside. In a small grinder, put the ginger and chillies. Grind them to form a paste. Keep aside. In a bowl, add the soaked soya granules, green chili-ginger paste, mashed potatoes, chat masala powder, dry mango powder (or lemon juice), sugar and salt. Mix well. Make small round patties from the mixture. Coat them with the remaining half of the soya granules. Take a pan and sprinkle the oil. Once the pan is grased, put the patties. Cook them on medium heat on both sides till they turn brown. Top up the patties with chutney or ketchup. Lovely tikki would love to include soya granules in out diet. Thanks.